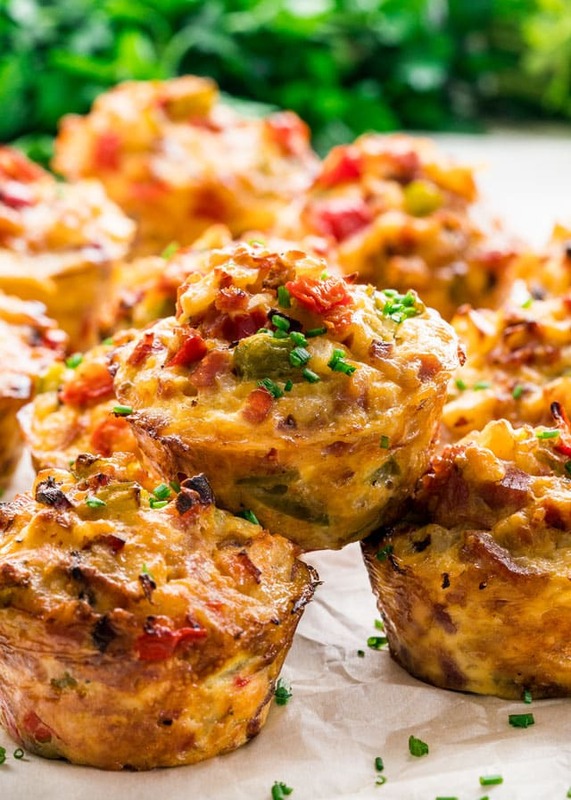 These Leftover Ham and Cheese Breakfast Muffins are a perfect use of that leftover ham and you’ll end up with these delicious breakfast muffins. The perfect breakfast on the go! Since breakfast is my favorite meal of the day, I always like to make something that I know I’ll love. 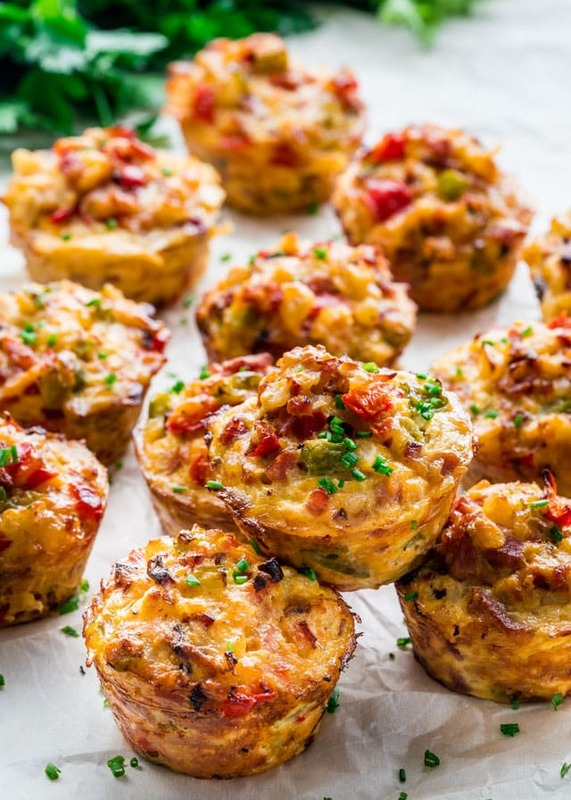 The problem is that unless it’s the weekend, we don’t usually have much time in the morning for big fancy breakfasts which is why I love these perfect breakfast muffins. I made a big ham for Thanksgiving and so we had lots of leftover ham. Usually I love to make my leftover ham and bean soup but this time I decided to go with breakfast. These breakfast muffins are really easy to put together, in a matter of minutes and you’ll have breakfast on the go for a few days. Really good and delicious breakfast, one of my favorites. These breakfast muffins are really simple using some basic ingredients you’re likely to have in your fridge. 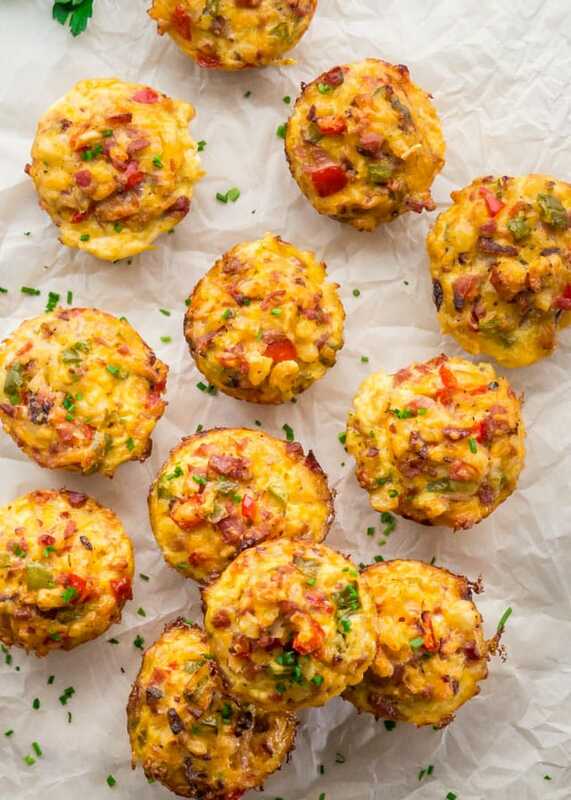 They’re pretty much a ham and cheese egg muffin with lots of bell peppers, so these muffins are prefect for throwing in some veggies that you may have, like asparagus or spinach. The best thing about these egg muffins is that they freeze well. I usually wrap them up individually in plastic wrap then place them in an airtight container and store them in the freezer until I’m ready to have one. When ready to eat just pop a frozen one in the microwave for about a minute and breakfast is ready. These breakfast muffins really are the ideal breakfast on the go. Try this easy egg muffin recipe for a different version. 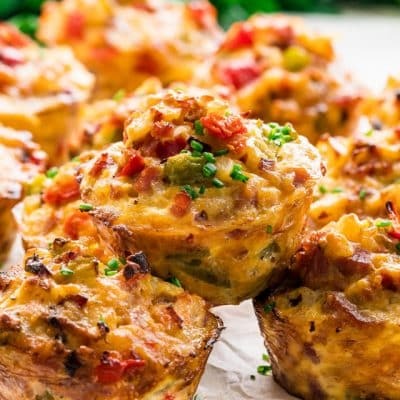 These LEFTOVER HAM AND CHEESE BREAKFAST MUFFINS are a perfect use of that leftover ham and you'll end up with these delicious breakfast muffins. Breakfast on the go! Preheat the oven to 375 F degrees. Spray a 12 cup muffin pan with cooking spray. Heat the olive oil in a large skillet over medium heat. Add the onion and cook for about 2 minutes until it starts to soften. Add the chopped bell peppers, hash brown potatoes and season with pepper. Stir everything together and cook for about 5 minutes until the potatoes start to brown. Add the ham and cook for another minute until the ham heats through. Transfer this mixture to a large bowl and let it cool for about 5 minutes. In a smaller bowl whisk the eggs, milk and hot sauce together. Pour this mixture over the ham mixture. Add the shredded cheese and stir everything together. Using an ice cream scoop fill each muffin tin with the egg and ham mixture. You can fill all the way to the top, and you should have enough for 12 muffins. Place the muffin pan in the preheated oven and bake for 25 to 30 minutes or until set and the muffins start to get golden on the top. Let the muffins cool for a couple minutes in the muffin pan before transferring to a cooling rack. I did not use any additional salt in this recipe because the ham is salty enough for my taste but feel free to add salt if needed. Store leftover muffins in an airtight container in the fridge for up to 5 days. To serve, reheat in the microwave for 30 seconds. How to freeze: Once the muffins are cooled completely, wrap each muffin tightly in plastic wrap, then place them in an airtight container and store in the freezer. To serve, reheat frozen, unwrapped for about 1 minute. 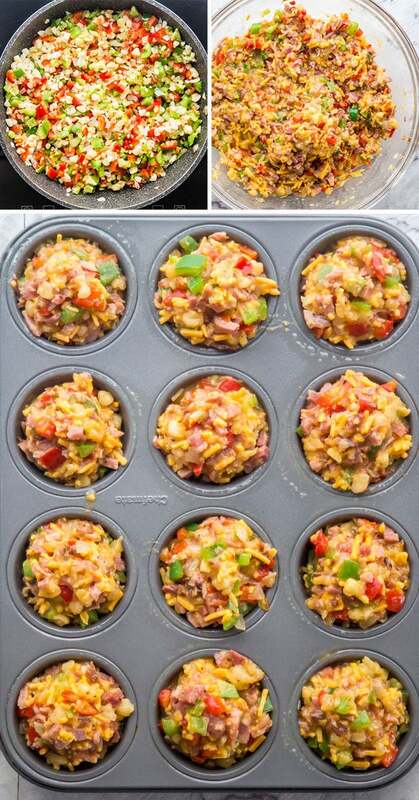 I made these breakfast muffins for my family after having lots of leftover ham after Christmas and they were unbelievably delicious. Everyone raved about them! Thanks so much for sharing!